1. Mix orange juice, mint, vinegar and cinnamon in medium bowl. Add peaches; toss to coat well. Set aside. 2. 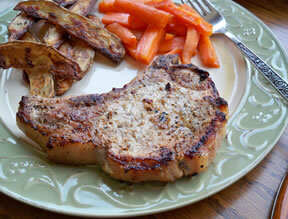 Rub Pork Rub evenly on both sides of each pork chop. 3. 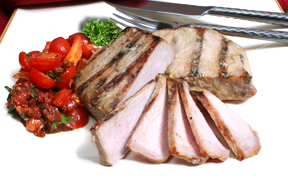 Grill over medium heat 5 to 7 minutes per side or until desired doneness. Gently toss raspberries with peach mixture. 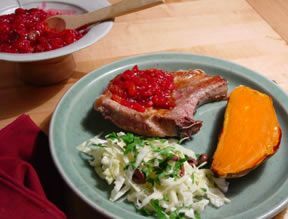 Serve with pork chops.Test Kitchen Tip: Use 1 can (15 ounces) sliced peaches, drained and chopped, and 1/4 cup frozen raspberries, thawed, in place of the fresh fruit. Use only 1 tablespoon of the orange juice.